MARCH saw the Leon range command its strongest sales ever, with 2,183 cars sold – even without the benefit of sports models to bolster registrations. And that’s significant, as sales of the previous car featured an unusually high mix of around 30-40% of its most powerful and expensive models. So things should improve significantly with the introduction of the new Leon FR into showrooms from mid-July (it’s available to order now). The FR, for Formula Racing, brand might not be as entrenched in buyers’ consciousness as the GTI, VXR, vRS and Renaultsport monikers, but Seat’s success with its sporting models seems to suggest that it is making good progress in its role as the Volkswagen Group’s more youthful, sporting brand. The firm’s prominent motorsport involvement in both World and British Touring Car Championships is also clearly key to promoting this. 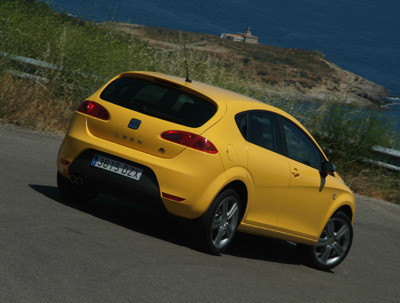 Indeed, Seat sees the Leon FR’s typical customer as a 31-year-old single male who likes sport, including motorsport. He also actively enjoys driving, covering on average 14,000 miles a year. Normally such customer profiles lack credibility, but Seat’s seems close to the mark. Perry Clarke, the company’s national business sales manager, underlined the brand’s expectations with the Leon range a few weeks ago in an interview with Fleet News. Given the value that the Leon represents, and its obvious style, the FR models will undoubtedly be a welcome addition to the range as far as fleet sales are concerned. There are two models to choose from. The 2.0-litre TFSI petrol engine is borrowed from the Volkswagen Golf GTI and delivers 200bhp and 206lb-ft of torque, allowing it to sprint to 62mph in 7.3 seconds. The turbodiesel version is the familiar 2.0-litre TDI unit with the recent 170bhp power upgrade and 236lb-ft of torque. Slower to 62mph by 0.9 of a second, of more significance to business buyers is its official combined fuel economy figure of 47.1mpg, compared with the petrol’s 35.8mpg. CO2 emissions are 190g/km and 161g/km for the petrol and diesel respectively. The FR models start at £16,995 for the 2.0-litre TFSI with the diesel commanding an additional £500 – that small increase basically covering the cost of the standard diesel particulate filter. Standard equipment includes dual-zone climate control, MP3 compatible CD player, electrically-adjustable folding door mirrors, steering wheel audio controls, tyre pressure sensor, cruise control and a trip computer. Growing significance is being put on fleet sales at SEAT and the FR will unquestionably help its ambitions. Andy Webb, Seat’s head of fleet sales, anticipates the FR models will take around 30% of all Leon sales. That means between 2,500 and 3,500 sales of FRs per year. Tentatively, Seat suggests around 30-40% of all Leon sales will be paid for with company money. The overall sales split for the Leon FR range is anticipated to be in the region of 60% diesel and 40% petrol. A DSG clutchless manual gearbox will be introduced later in the year on the petrol model, and, although not confirmed, it seems likely that a DSG version of the diesel will follow. An even more powerful Cupra with around 240bhp will also debut at the British International Motor Show next month before going on sale later this year, providing the extra power to compete with super hatches such as the Vauxhall Astra VXR and Ford Focus ST. The FR Leons are good-looking cars, the neat exterior design working well with the standard 17-inch alloys, silver door mirror caps and more aggressively-styled front and rear bumpers. Inside it’s not so striking. It is actually rather plain. The dials, featuring a prominent rev counter and white-backed instruments, lift it slightly, but it’s not as dramatic as the exterior. What does impress are the seats, the heavily-bolstered front items hold you tightly, yet remain comfortable. Underway, both the petrol and diesel models impress. The petrol engine is willing and smooth all the way through its range while the diesel makes up for its lesser power with an earlier and more prominent surge of torque. They both make for an enjoyable driving experience, proving refined on motorways and providing ample performance, tidy handling and enough of a sporting engine note to enjoy them on more challenging roads. The ride is firm, though not uncomfortable. The steering is light and precise, but it could do with a touch more weight. A cheaper Golf GTI? Inevitably, comparisons will be made. The Leon FR is certainly as much fun, if not more so, yet is different enough in character to throw off the ‘rebodied Volkswagen’ tag of old. A competent all-rounder, the FR in either petrol or diesel guise is appealing – the latter especially for fleets with its fuel economy and emissions benefits.